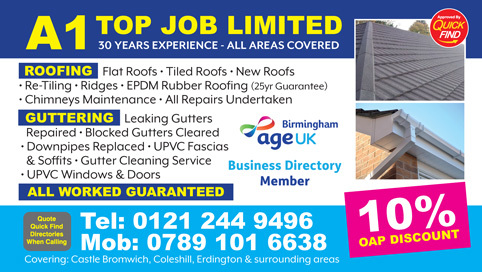 Approved and recommended by Quick Find Directories, A1 Top Job Limited are a local trusted roofer in Birmingham, Castle Bromwich, Erdington, Coleshill, Marston Green and surrounding areas. What does "Approved by Quick Find" mean? Find out more about our rigorous checking process here.